Musician for over 10 years. Played shows all across Ontario and even recently did a tour in Ghana playing guitar. Have taught private lessons in own home for many years and have taught private and group lessons with various companies. Stephen’s passion for music began at an early age playing the guitar and song-writing. As his love for music grew, he aspired to broaden his musical knowledge and began learning new instruments including the drums, piano, bass, guitar and ukulele. 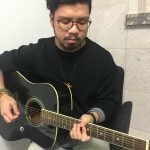 After many years of playing in various types of bands, he decided to pursue music in a post-secondary setting. Stephen attended the Music Industry Arts and Performance program at Centennial College, where he majored in guitar, received mentor-ship from many industry professionals, and was able to learn both theory and business aspects related to music. Throughout his time at Centennial, he received many scholarships including the Jim and Irene Scott Academic Achievement Scholarship and graduated in the summer of 2017. Seeking to share his passion for music with others, Stephen’s teaching philosophy emphasizes the joy and excitement in playing and learning music.